We call this Carbonara à la Ben because it’s only loosely based on a classic Carbonara, but it is a firm favourite and staple in our house; everyone loves it, from our 16 month old, to our 7 year old and Sophie still claims it’s a great hangover meal! It’s also one of those wonderful, feel-good carb-tastic dishes. What I particularly love about this recipe is how cheap and easy it is to make, making it a great one if you’re just beginning to take baby steps in the world of cooking. I usually make this dish with sliced mushrooms, but just didn’t happen to have any in when making it this time, it’s your call whether you add them or not. 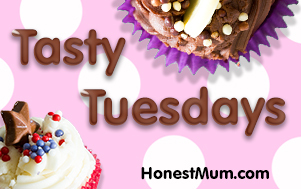 I am linking this tasty meal up with Tasty Tuesdays, click on the linky below to check out some other tasty offerings. Switch your kettle on. Get all your ingredients ready. Mix the egg, the milk, grated parmesan and corn flour together in a separate bowl. Pour the pasta over the onions, bacon and garlic. Pour the carbonara sauce over and stir well. Don't forget, if you like this recipe please share it! We'd love it if you came back and shared your comments, thoughts, and rating on this dish once you've cooked it. Bon appétit! suzanne3childrenandit recently posted…MAD Blog Awards Finalist – Moi?! Thanks! And you’re right – whoops! Added in now, yes just the one egg. This sounds so quick and simple! I love recipes like this! And I could easily adapt this to include a veggie alternative (Quorn do a bacon flavour slice which is nice) so I think this will be included on my menu very soon! I’ve tweaked it before to make it veggie – replacing bacon with tomatoes, that works well too. A quick and easy staple, I think I’ll be adding this to the meal plan for next week. We have a meal we call carbonara, but we have obviously adapted to so much it appears it doesn’t resemble real carbonara anymore. We use egg, bacon and pasta but we use cheddar instead of parmesan and creme freche instead of cream. This is the same, we call it carbonara but it only vaguely resembles a real carbonara – whatever works though! Thanks lovely, this is one of my absolute favourites too – this one is a great hangover dish! Love this dish! So simple to cook! Carbonara is a firm fav here and this looks delicious!! I eat this at home and order it when we go to Italian restaurants too, slightly obsessed! It’s a great, easy, fall-back family meal I find. Love the ease of this dish, and much tastier than anything I’ve bought ready made. It lends itself to tweaking, as you suggest, and I like your suggestion of the veggie alternative. I’m glad you enjoyed it – it was originally a recipe that my mum taught me which Ben has since tweaked and made his own.